When to buy your tickets for Vietnam train from Hanoi to Sapa? Where to buy your tickets for Vietnam train from Hanoi to Sapa? 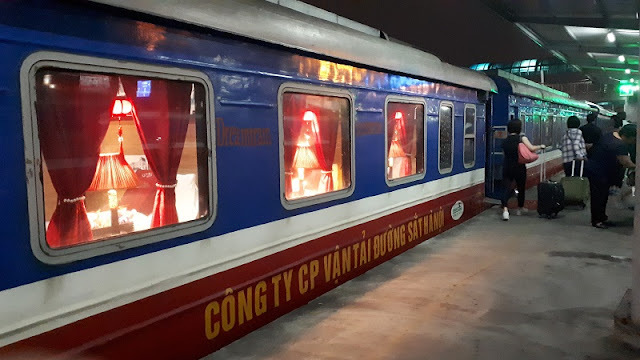 What type of tickets we should buy for Vietnam train from Hanoi to Sapa? Truthfully speaking, going to Sapa on a hard seat, or even a soft seat is very exhausting. You almost can’t sleep, your legs will be in pain as you can’t stretch them comfortably. You also have to hire a blanket (around 30 thousand VND) to be less cold. So in short, in my opinion, to reach Sapa, the soft berth is the best option. The price ranges are different for different types of berth and different sorts of cabins. If your berth is in a cabin with 6 berths, my advice is to buy the lowest one. Though it might be slightly more expensive, you will feel much more comfortable. I bought the highest one once, and swear that I will never purchase it one more time because the room is too small and stuffy. If your trip is not on a budget, you might consider luxurious train service. Traveling to Sapa by train might add more colors in your trip, as you can have a chance to peacefully enjoy the mountainous scenery outside. That is what I like most about traveling by train. Imagine that you are sitting on your seat or berth, sipping your cup of tea or coffee and enjoying your favorite book, is it a wonderful moment to have. Once again, we wish you a great time in Sapa specifically and in Vietnam generally. We hope that this article might be helpful in some ways. If you wonder what to do, where to go and what to visit in Sapa, there are also other articles mentioning these topics on our website. Anyway, wherever you go, I bet that you and your traveling buddy will have a whale of a time and create unforgettable memories together. Again, we wish you have a wonderful year, filled with wonderful trips by meeting wonderful people and traveling to wonderful places.